The comment concerning the spiritual status of Nigeria credited to the general overseer of the Deeper Life Ministry, Pastor William Folorunsho Kumuyi during his courtesy visit to Gen. Muhammadu Buhari at the Aso Rock Villa where he was quoted as saying that “God created Nigeria” is nothing short of a penicillin applied to a deep wound to ease or relieve pain. The statement, I understand is buttressed on the fact that the acclaimed ‘man of God’ is not yet done with the spiritually-caged deceit championed by most unscrupulous and dishonest Pastors and clergymen that has since flooded the murky waters of political market in Nigeria aimed at simply to favour themselves, their allies and their political masters. The activities of these pastor turned politicians has become especially obnoxious and detestable to the discerning populace in such a way that mankind has been fore-doomed for failure if a highly revered and sacred abode(Church) of God has been so abysmally desecrated by those entrusted with the responsibility to maintain its sanctity. To even engage himself in a parley with the most damning and unrepentant terrorist in the world speaks volume of the mentality of the acclaimed man of God. This is a man who was born into a Christian family in a small village in Erin-Ijesha, Osun State some 74 years ago and had a sound educational background as a mathematics lecturer and claimed to have received Christ on the 5th of April, 1964. Throughout all these years that Dr. Kumuyi has been preaching the Bible pretending to be a holy man of God, one would have expected that this gentleman would be able to discern between good and bad, evil and holiness, light and darkness, but alas, our learned pastor still have to learn or have not learned anything at all. For the records, Mr. Kumuyi, God did not create Nigeria; it was an artificial creation by Frederick Lugard, a British overlord with the help of his wayward girlfriend, Flora Shaw in 1914. They brought about the most unpalatable amalgamation that gave birth to the present British experiment called Nigeria which its expiry date(January, 2014) has been neglected by all ethnic jingoists in Nigeria, including the very person you visited. Sir, if you would be honest with yourself(forget your business interest in Nigeria), you will quite agree with me that you completely hit below the belt by thoroughly disgracing and messing up your good self by insinuating that God never made a mistake in creating Nigeria. Whom are you talking to? Do you think everybody belongs to the stock of those gullible folk you keep in your church from Tuesdays through to Saturdays, holding them at spiritual gunpoint to cough-out all manner of legal tenders on Sundays? Extorting Dr the poor masses and congregations through their tithes, offerings, sowing of seeds in dollar, euros, pounds sterling, and all manner of currencies with the delusion that they will receive higher blessings which have continued to elude them. But sorry to disappoint you Sir, people’s eyes are wide open now that the harsh but true reality is beginning to dawn on them. Running to Aso Rock to campaign against the inevitable and irreversible division of Nigeria in order to protect your business interests is not going to change anything. Take it or leave it, Biafra restoration is very imminent and rightfully ordained by the Most High God, Chukwu Okike Abiama. Whether sycophants like you accept it or not is irrelevant as Biafra is already here and there is nothing any mortal can do about it. Biafrans, can now clearly see that what our leader, Mazi Nnamdi Kanu said about Yoruba churches has expressly come to manifestation? These people only care for the tithe and offerings you contribute which they use in living large and expanding their scope of businesses. When a Deeper Life member, Madam Bridget was beheaded in Kano, her general overseer otherwise known as G.O, never uttered a word, he never ran to Aso Rock to ask his friend, Gen. Buhari the reason he is yet to prosecute the criminal who perpetrated the gruesome act? When the northern Alamajiris who beheaded her were set free by a highly-compromised court in Kano, ‘Daddy G.O’ pretended and feigned to be too busy or rather, ignorant of the news. Recently, Osun State was raped in broad day light, this supposed educated man being from the Yoruba stock never lent his voice in condemnation to Gen. Buhari’s selfish political atrocities. When Buhari’s kinsmen in the guise of Fulani herdsmen were busy killing fellow ministers of God in their private houses and churches in Benue State, Foloronsho Kumuyi was too busy to understand what was happening, perhaps he’s so much engrossed with the proceeds that accrues from his spiritual businesses and projects all over the country, forgetting that his fellow cleric is being mowed down in the most sordid, unthinkable and abrasive manner. He never deemed it necessary to ask Buhari to call those savage nomads to order. 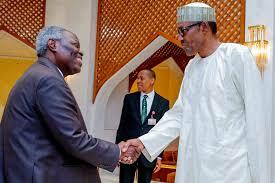 Now that the Biafran Referendum is sounding at its peak, Mr. Kumuyi ran to ask Buhari never to allow them go. In the process of trying to protect his vast business empire in Lagos which Igbos are the major pillar, Kumuyi exposed his ignorance to the entire world by insinuating that God created Nigeria. If I may ask Mr. Kumuyi, who then created Biafra? Do you have an evidence to support your claim that God created Nigeria? But I have a lot of historical evidences/facts including ancient maps at my disposal to buttress my point. This is how you men of God deceive people with your lies from the pit of hell once you mounted the pulpit. Anybody who say God created Nigeria must be hallucinating. Kumuyi, you are a liar and there’s no difference between you and Lai Mohammed. The indigenous people of Biafra(IPOB) has no problem with any religion or church, but when people like you come up to wreck havoc, we must stand up to correct the wrong signal you have been paid to give in order to mislead people. William Foloronsho Kumuyi, if you are a man of God, go on air and correct the lies you told the world or lose all your respect forever. And on this note, Mr. Kumuyi I put it to you that you are yet to be born again as it has become obvious through your words that you’re only serving your interest and that of your masters.